Kuwait Finance House (Malaysia) Bhd (KFHMB) is looking to buy Grade A commercial buildings and residential towers in Kuala Lumpur. "KFHMB prefer properties in the KLCC area. There are a few going below market value. Any transactions by KFHMB will be done outside of the bank's balance sheet," a source said. He said KFHMB will set up a special real estate fund or entity to invest here, similar to what it did when it bought Glomac Tower and The Pearl @ KLCC. KFHMB has a proprietary equity interest in KFH Reetaj Sdn Bhd, the holding company of Prestige Scale Sdn Bhd, which bought Glomac Tower in late 2007 from Glomac Bhd, for RM577 million. Reetaj is 81 per cent and 19 per cent held by its parent KFH and KFHMB, respectively. The Pearl, a 41-storey condominium, was bought by Flora Bliss Development Sdn Bhd, a consortium led by KFHMB for RM550 million in 2008, from Ceramic Home Tiles Sdn Bhd, linked to Malton Bhd. On KFHMB's move to not proceed with the purchase of half of YNH Tower on Jalan Sultan Ismail for RM920 million, the source said the plan was aborted as the parameters had changed along the way. "From day one that we looked into the deal until now, there were a lot of variation. There were certain conditions that we stipulated, which were not met within the transaction," he said. 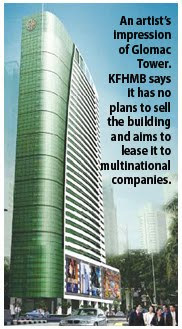 The source said KFHMB intends to continue to participate in property development in Malaysia through various means. KFHMB may buy shares in the property development company, or provide financing for the construction of the project. It may also provide Mudharabah and Musyarakah, akin to the underwriting of sale, or buy the building like it did for Glomac Tower and be a master lessor. Besides Glomac Tower and The Pearl, KFHMB has invested in Pavilion KL, Avare and The Oval in Kuala Lumpur, Sunway South Quay in Bandar Sunway and The Sanctuary Penang. KFHMB had entered into a Musyarakah agreement with a fund to underwrite/purchase two residential blocks at Pavilion KL. The developer, Kuala Lumpur Pavilion Sdn Bhd, a unit of Malton Bhd, was paid according to the progress of the project during construction. The condominiums were later sold for capital gains. According to KFHMB director for real estate advisory, Siti Mariam Mohd Desa, there are no plans to sell Glomac Tower. "We are going to lease the building to multinational companies. We want a good range of tenants but it will all depend on the market," she told Business Times in a telephone interview. On talks that Glomac Tower will be renamed Kuwait Finance Tower, she said it has not been decided. Datuk Seri Ahmad Husni Mohamad Hanadzlah hitting the gong to mark the opening of MAREC. With him are Loke Fu Wah (left) and Julie Wong. KUALA LUMPUR: The Malaysian Institute of Estate Agents (MIEA) wants to introduce more education and development courses to enhance the standard of real estate agents in the country, said president Julie Wong. “We plan to bring in more management courses like the CIPS (Certified International Property Specialist) to enhance the knowledge of our real estate agents,” she said after the opening of the Malaysian Annual Real Estate Convention (MAREC) on Saturday. She said the MIEA also had plans to bring in renowned speakers from around the globe for future MAREC or realtor conventions. An agreement was signed on Saturday between the MIEA and US-based National Association of Realtors (NAR) for the provision of a Certified Residential Specialist (CRS) course for Malaysian realtors. “The NAR has other relevant courses as well but we are going to concentrate first on the CRS. There will be other education development courses in the pipeline and we will introduce them stage by stage,” said Wong. MAREC organising chairman Loke Fu Wah said the local property sector was showing promising signs of recovery. “The market reached its bottom last year and is picking up,” he said. Wong said the property market was moving and buyers were slowly coming back. “Last year, people held back their purchasers and adopted a wait-and-see approach,” she said, adding that the residential sub-sector would be the biggest driver of growth for the property market this year. Wong also said the Government’s recent amendment of the (5%) real property gains tax (RPGT), which would now only apply to properties sold within five years from their date of purchase, was a good call. The two-day MAREC was officiated by Second Finance Minister Datuk Seri Ahmad Husni Mohamad Hanadzlah. Themed The Millionaire Real Estate Agent, it featured 20 speakers from the United States, Singapore and Malaysia, with The Star being one of the sponsors. In his keynote address, Ahmad Husni said he was optimistic about the outlook for the local property sector as the affordability of local residential properties was at an “all-time best”. “Affordability has never been better. Our banks have continued to support the market with very attractive mortgage rates at a base lending rate of around minus 2% and in some cases, below 2.4%. Ahmad Husni also said the property market was one of the most reliable barometers of the health of any economy. He is confident Malaysia will achieve its target of a 5% gross domestic product growth for 2010. A leading property development company in Miri, Sarawak, Espio Enterprise Sdn Bhd, will invest an initial RM60 million to develop phase one of a mixed development project in Sibu, Sarawak. Managing director Datuk David Goh Kieng Ping said the Swan City project, to be developed on a 7ha site, will comprise over 100 residential units and commercial buildings to be completed within three years. "However, its biggest component will be the construction of the state's first and biggest purpose built hypermall for the Giant International Retail Group which will have a built-up area of 1.2ha. The hypermall is expected to be ready and operational by end of next year. "This is going to cost us RM30 million," he told reporters in Sibu after the ground-breaking ceremony for the project by Sarawak Environment and Public Health Minister Datuk Seri Wong Soon Koh and Deputy Transport Minister Datuk Robert Lau Hoi Chew. The marketing director for Giant Supermarket Ho Mun Hao, said there are currently four Giant supermarkets in the state which were a big boost to local farmers as it helps them to sell their produce. Meanwhile, Goh said the company is now entering the state central region because of its huge potential, given the location of the Sarawak Corridor of Renewal Energy. "Sibu is going to be the next city in the state after Kuching and Miri, probably in about 15 years or less from now. "We want to contribute to its development. This Sun City project is one initiative to Sibu's physical and human resource development," he said. Goh said due to its central location, Sibu, with a population of one million people, will become the centre for shopping. The group is also undertaking the multi-million ringgit Taman Tunku Housing project in Miri. Sime Darby Property, a unit of Malaysia’s Sime Darby Bhd, plans to sign a joint venture agreement with a local partner to develop an “integrated commercial project” in its Bukit Jelutong township, outside of Kuala Lumpur. The company will sign the agreement tomorrow, it said today in an e-mailed invitation to the event, without naming the partner.